Reason for Reading: I’m fascinated by how the Renaissance was a time for such dramatic strides in so many areas seemingly all at once, and Michelangelo’s works are definitely a favourite of mine. Synopsis: Michelangelo and the Pope’s Ceiling analyzes all of the troubles that ailed Michelangelo in his four years of painting the Sistine Chapel for the religious leader of his time, Pope Julius II. Michelangelo was forced by the pope to paint the ceiling, despite how Michelangelo considered himself a sculptor rather than a painter, as well as various issues with his family, a lack of money, a rivalry with the young up-and-coming painter named Raphael, an expected completion date that moved ever further away, and war being waged outside of the city. This is an account of how Michelangelo dealt with all of the obstacles to paint one of the most magnificicent artistic endeavors the world has ever seen. Why you should read this book: Following in the footsteps of Renaissance men like Michelangelo, King presents an informed look at a wide variety of subjects: art, history, politics, mythology, and religion, as well as the sociology between Michelangelo and his peers, family, and patrons. It makes for an enthralling read, because you feel like you’re getting the whole picture about what Michelangelo himself was dealing with on a day to day basis. Even a slight interest in Michelangelo or an admiration for his work is enough to keep the reader interested in this book; obviously an appreciation of the arts helps, but no elitist background on painting or history is necessary. Why you should avoid this book: If you’re a visual person who wants to see exactly what King is writing about when describing the Sistine Chapel, you’re basically out of luck here. There’s only two colour pages with pictures of the actual ceiling, in which few details are visible, so it would help to have another book with a more in-depth collection of pictures for handy reference. Michelangelo and the Pope’s Ceiling covers a broad spectrum of topics which would appeal if you want to see the full picture of Michelangelo’s time in Rome, but wouldn’t be the greatest choice if you’re just interested strictly in, say, artistic techniques. The Piazza Rusticucci was not one of Rome’s most prestigious addresses. Though only a short walk from the Vatican, the square was humble and nondescript, part of a maze of narrow streets and densely packed shops and houses that ran west from where the Ponte Sant’Angelo crossed the Tiber River. A trough for livestock stood at its center, next to a fountain, and on its east side was a modest church with a tiny belfry. Santa Caterina della Cavallerotte was too new to be famous. It housed none of the sorts of relics – bones of saints, fragments from the True Cross – that each year brought thousands of pilgrims to Rome from all over Christendom. However, behind this church, in a small street overshadowed by the city wall, there could be found the workshop of the most sought-after artist in Italy: a squat, flat-nosed, shabbily dressed, ill-tempered sculptor from Florence. Michelangelo did not actually start painting by the middle of May. The execution of a fresco, especially one comprising 12,000 square feet, took a great deal of planning and forethought before the first stroke of paint could be applied. The art of fresco enjoyed such esteem precisely because it was so famously difficult to master. Its myriad obstacles are reflected in the Italian expression stare fresco, meaning ‘to be in a fix or a mess.’ Many artists besides Leonardo da Vinci (who failed so spectacularly with The Battle of Anghiari) had found themselves in a fix when confronted with a wall or vault to paint. Michelangelo’s latest Genesis scene was split in two. The left half showed Adam and Eve reaching for the forbidden fruit in a rocky and barren Eden, the right their subsequent expulsion from the garden by an angel brandishing a sword above their heads. Michelangelo, like Raphael, painted the serpent with a female torso and head. With her fat coils knotted around the tree of knowledge, she hands the piece of fruit to Eve, who reclines on the ground next to Adam, her left arm extended to receive it. The simplest of the Genesis scenes painted so far, it featured only six figures, all considerably larger than those in the previous panels. In contrast to the tiny figures in The Flood, the Adam of The Temptation stands almost six feet tall. Also recommended: The Birth of Venus by Sarah Dunant; The Other Boleyn Girl by Philippa Gregory; Girl in Hyacinth Blue by Susan Vreeland. Also by this author: The Judgment of Paris: the Revolutionary Decade That Gave the World Impressionism; Brunelleschi’s Dome: How a Renaissance Genius Reinvented Architecture; Ex-Libris; Domino. 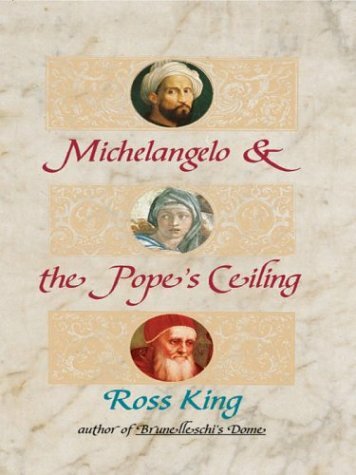 Fun tidbit: Ross King explains in the book how, contrary to popular belief, the romantic idea of Michelangelo toiling on the ceiling alone and on his back for four years is a false concept.